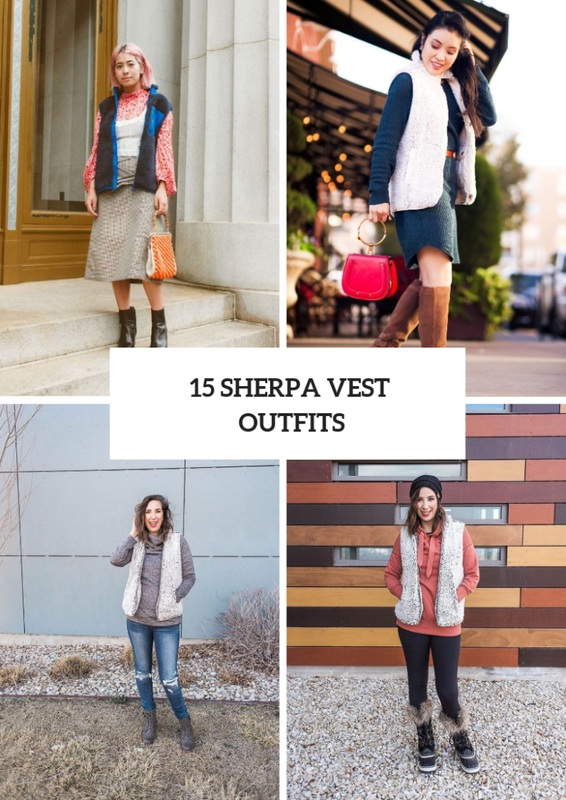 We have already shared with you comfy and trendy sherpa jacket and sweater ideas and ways how you can combine them with other pieces of clothes, accessories and shoes, so today let’s take a look at gorgeous and cozy sherpa vests. 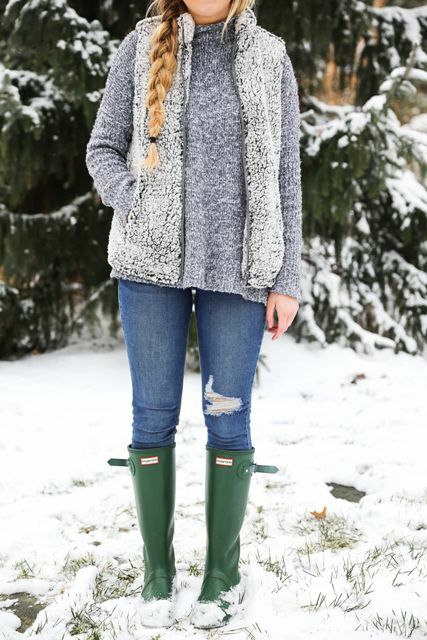 First of all, you should pick up a perfect vest, for example, from a waterfall to fitted one. Secondly, think about color for your new item, but remember that the most popular ones are black, beige, gray and brown. Right now you can scroll down to consider all ideas. Enjoy! 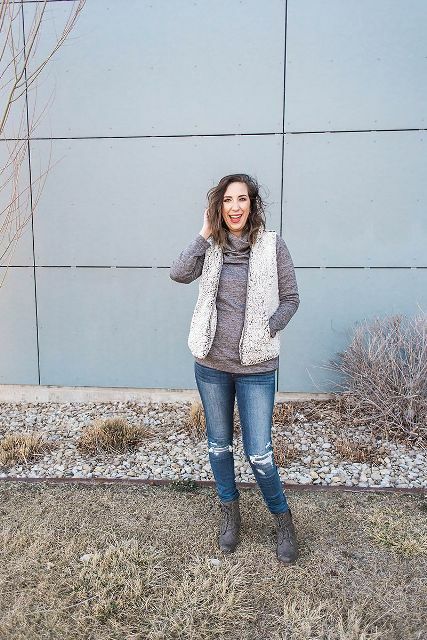 If you are looking for an awesome travel outfit, then you can take a peach hoodie sweatshirt and combine it with black leggings, a black beanie hat, a gray sherpa vest and fur lace up boots. 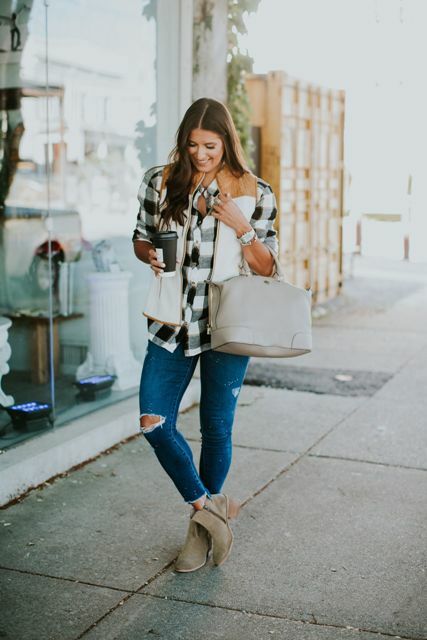 If you want to create a look for every day, then try to repeat a combination with a black, gray and white plaid button down shirt, distressed skinny jeans, a beige leather bag, gray suede ankle boots and a white and brown vest. 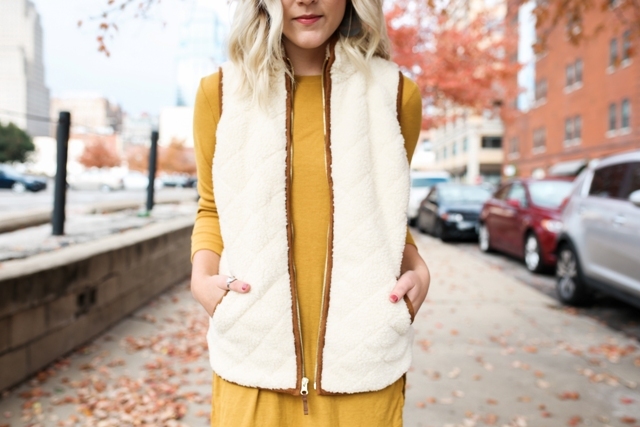 Or you can mix a white shirt with a white sherpa waterfall vest, dark colored jeans and ankle boots. 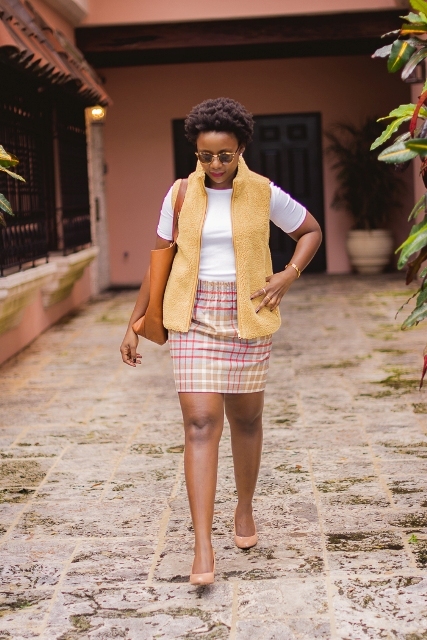 You don’t need too many items to create an amazing outfit, for example, you can just take a black mini dress and pair it with a beige waterfall long vest, sunglasses and brown leather high boots. 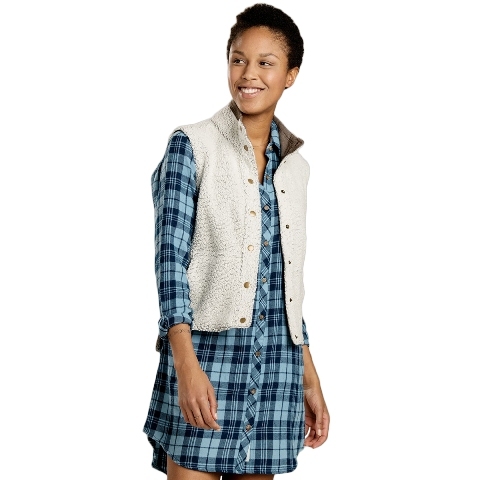 Or you can combine a navy blue mini dress with a white sherpa vest, a red leather belt, a red mini bag and brown suede high boots. Wanna something eye-catching? 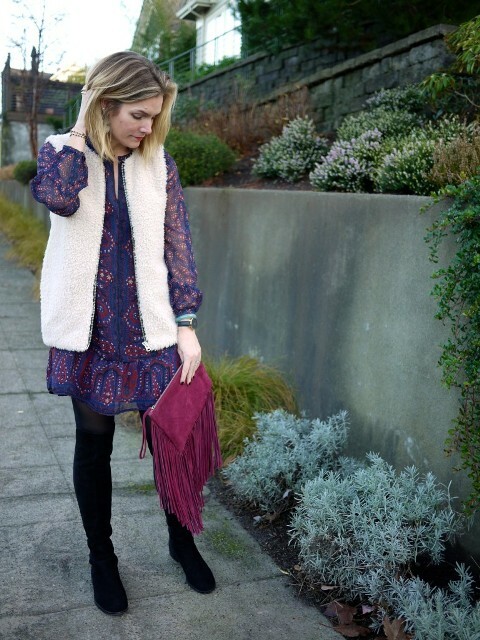 Then mix a printed ruffled mini dress with black tights, black flat high boots, a white vest and a purple suede clutch with a fringe. 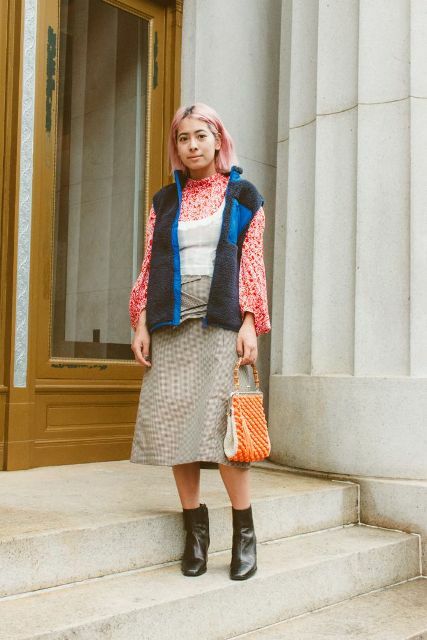 Or combine a printed blouse with a white top, a blue and black vest, a midi skirt, a printed bag and black leather boots.